It might not be apparent to the naked eye, but bees are remarkably hirsute creatures, carpeted with three million tiny hairs—the same number as a squirrel. And in the insect world (as opposed to the dog world), all those hairs help to keep creatures clean. The bee’s legs are “like feather dusters,” says David Hu, a mechanical engineer at Georgia Tech. When those leg hairs brush hairs elsewhere on the body, they can catapult dust away from the bee at 1,000 times the speed of gravity. Hu says these tricks of the insect world might help us develop better self-cleaning materials, such as solar panels that dust themselves. David Hu is a mathematician and a professor in the departments of Mechanical Engineering and Biology at Georgia Tech in Atlanta, Georgia. JOHN DANKOSKY: This is Science Friday. I’m John Dankosky. Ira Flatow it is away. If you’ve seen The Martian, you know that one of astronaut Mark Watney’s chores on the red planet is dusting off the solar panels. You wouldn’t want that infamous Martian dust to switch off the lights or power down the rover, right? Well, why not have the panels just clean themselves? There’s another surface like this that’s notoriously dust-free, and we all have them right there in our heads. It’s our eyeballs. Turns out that the curve of your eyelash does a really good job deflecting air currents that might be propelling dust toward your eye. The next guest here has studied the eyelashes of all sorts of animals at the zoo and put eyelashes in a wind tunnel, too. He says, “Engineers might have a thing or two to learn about how nature uses hair.” David, who is an associate professor of mechanical engineering and biology at Georgia Tech, in Atlanta– he joins us today from Georgia Public Broadcasting. Welcome back to Science Friday, Dr. Hu. DR. HU: Hi, John– great to be here. JOHN DANKOSKY: And if you’ve got a question about the mechanics of hair, you can give us a call, 844-724-8255. That’s 844-SCI-TALK. Well, OK– if we think about hair, we think about dogs and cats, not hairy bees. Tell us about the hair on bees. DR. HU: Well, a bee has quite a lot of hair, actually. It has three million hairs over its body. It has the same number of hairs as a squirrel. And it’s just, the hairs are very small and very closely packed. And the hairs serve a very important purpose. So the bee, it makes a living by collecting pollen. And so every day, it actually collects six times its body weight in pollen, covering its body. And so it’s got to remove this pollen periodically. And to do that, what it does is, it takes these arms. These arms of the bee actually are hairy, too, just like the bee. And it rubs them all over its face and body. And when it does that, something miraculous happens. –Charles Schulz comics, that was just covered in this personal bacterial cloud. But on these bees, actually, when they clean themselves, they use the elastic energy of these hairs to shoot off the particles at high speed. JOHN DANKOSKY: So that’s what the hair is for on bees. So it’s as many hairs on the body of a bee as on a squirrel. And it’s this very specialized hair that helps them stay clean. DR. HU: That’s right. The bee’s hairs are so short and stubby, and they are spaced at the right spacing so pollen just gets wedged between them. And so when it does this flicking motion, the hairs deflect and act like little catapults. And they just shoot off the pollen. JOHN DANKOSKY: It’s so cool. Now, some insects actually have hairy eyes, too. 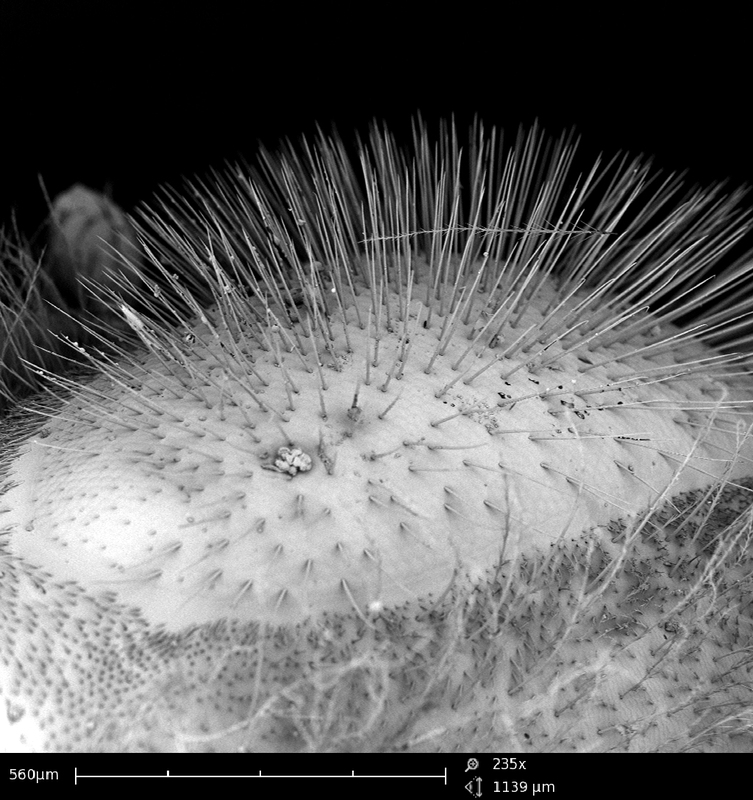 It seems like a strange concept to us, but what can we learn from the hairy eyes of a bee? DR. HU: Yes– now, the eye is interesting. It would seem to be the last place you would want a lot of hair. And their eyes are not like ours. So we actually have eyelashes that rim the eye. But the bee’s eye is– actually, it looks like a pin cushion. It has hairs just poking out like a pin cushion. And the eye is a compound eye so it has very small eyes that see between these hairs. Now, what happens is, when there’s pollen that gathers on this compound eye, the bee can also again perform this process of rubbing its eye and cleaning itself. And these eyes also act similar to the eyelash in that, imagine this bee’s flying through the air. These hairs that stick out, they create a protection zone– this stagnant zone of air– where basically, particles, instead of hitting it right in the eye, would veer right before it hits the eye. So they kind of allow the bee to see, but stay protected from the particles. JOHN DANKOSKY: Now, you find eyelashes fascinating– I guess I never thought of them. But now, after reading some of your work, I find them fascinating, too. You went to the zoo to measure the eyelashes of different animals. Tell us about that. — she was really fat and totally bald and had absolutely no hair. Except, she had these really long eyelashes. And I got thinking, why would babies have no hair, but why do they have to have these eyelashes? So the very next day, I asked my student to go to the zoo and the American Museum of Natural History, where they have a lot of these animal furs where we could actually measure and see if any other animals besides humans had eyelashes. JOHN DANKOSKY: [LAUGHING] OK, and so you’re looking around the animal kingdom, and it turns out that animals do have eyelashes. And they’re used in more or less the same way as ours. DR. HU: That’s right. Almost all mammals have eyelashes, or their faces are furry. And moreover, these lashes, they’re not just arbitrary length. But we measured eyelashes all the way from a mouse, armadillos, pandas, all the way up to giraffes. And we found that, even though these animals didn’t have very much genetic relationship, their eyelashes were all quite similar. They all had a magic length. The length of the eyelash is about one third the width of the eye. And that’s pretty much true for the 30 animals that we measured. JOHN DANKOSKY: It’s so interesting. And pretty much, the eyelashes do the same thing in all these animal species. They’re just all about deflecting that dirt before it gets in the eye. DR. HU: Yeah, it’s a different kind of filter. I mean, for example, in your studio, you probably have an air conditioning or heating system where you have a filter, which is a ram filter that fluid hits it– the particles hit this porous surface and the particles get caught. And the problem with those filters are is that you actually have to replace them. Now the eyelash, basically, is a new kind of filter that basically just changes the air flow in such a subtle way you can’t even feel it on your face. But it changes the air flow so that you get half the deposition of particles than you would if you didn’t have eyelashes. So over a lifetime, that means you’ll blink– half as often, you’ll get half of those worrisome particles in your eye. And you get all this for free. It’s just when you walk forward, the eyelashes are there, and they change the flow of the air. JOHN DANKOSKY: Hmm. We’ve been talking about eyelashes, which are of course now fascinating to me, and hair on bees. But what about hair on dogs and cats? I mean, how do other animals use their hair? Because you’ve learned a lot about all these species. DR. HU: There’s a lot of animals with hair. And some of these most interesting animals are hairs that are so small that you can’t even see. So when we were reading papers in our article, we found that there’s even some hair that can act as a bacteriacide– they can actually kill bacteria on contact. These are the wings of cicadas. So the cicadas actually have hairs that are a nanometer in diameter. So they’re 1,000 times smaller than the bee hairs– so small the cicada wing looks like it’s shiny. But these nanometer-scale hairs, they actually act like small pin cushions. So when bacteria lands on them, they stretch the bacteria, and they cause it to get really thin in some places. So the bacteria actually explodes, just like a water balloon. JOHN DANKOSKY: Hm– that’s so fascinating. So one thing about hair on animals is it’s obviously there to protect them, and it’s there to keep them clean. But then, you know, our dog goes outside and tracks in all sorts of dirt. It seems as though dogs can still get pretty filthy even with this protective layer of hair. How does that happen? DR. HU: So the principles that we found, most of the benefits of hair are basically for small animals. So these insects, like the bees, the cicada, these small animals really are good at getting rid of particles. And we think that the bigger the animals are, so the less sensitive it is. I mean, it has special hairs around its eyes. But you’re right– a dog, a cat– pollen and other things won’t make as much of a difference to them. So for example, these– and they actually are– these hairs, actually, can be a danger, too, for them. So for these large animals, the hairs provide just a tremendous surface area they have to get clean. You might wonder why your pets never seem to get clean. Well, if you actually count the number of hairs on a cat– which we did– and figure out the surface area, so a cat, actually, has a surface area of a ping-pong table. So that’s basically all the little crevices that dirt, fleas, ticks, pollen, dust, it can aggregate. So to clean a cat is equivalent to cleaning this huge ping-pong table. DR. HU: –so yeah, beavers actually– they have special hairs that actually are so tightly spaced that air doesn’t escape from them when they go diving. So when a beaver goes diving, it’s actually encapsulated in a layer of air, and water doesn’t actually touch its skin. And well, it has all those hairs. It also has a lot of places to clean. So when a beaver’s grooming itself, it’s like it’s taking one of those devices and cleaning the ice hockey rink. JOHN DANKOSKY: –can I just ask you a very practical question, Doctor? How do you count all the hairs on a cat? DR. HU: How do you count all the hairs on a cat? The best way is to realize that they actually are pretty uniform. So most of the cat has a uniform density of hairs. So what we do is, we find small patches of hair and count the number of hairs per centimeter squared. And then we just multiply that by the surface area of the cat– which is modeled like a Coke can. JOHN DANKOSKY: OK, so it’s not as difficult as it sounds. You mentioned the story about your daughter, and it seems as though you find inspiration all over the world for some of the things that you study. And you’ve been on the program before, talking about some of these interesting lines of inquiry. What are some secrets beyond the hair on animals that you’re trying to think about right now that you want to study? DR. HU: You know, I think in our daily lives we’re just surrounded by all these mysteries. So one of the things– so we’re going to go to this fluid mechanists conference in Boston in two weeks, where we’re going to meet with all the fluid dynamicists all around the world. And some of the things we’re going to talk about is– one of them is, how long does it take to defecate? –you don’t have to stay there for 40 times more time– that this layer of oil is basically makes it a really good sort of solid dispensing system. JOHN DANKOSKY: You’ve left us with quite an image there, Doctor. I want to thank you for that. David Hu is Associate Professor of Mechanical Engineering and Biology at Georgia Tech in Atlanta. Thank you so much for your time. DR. HU: Thanks for having me on the show, John.